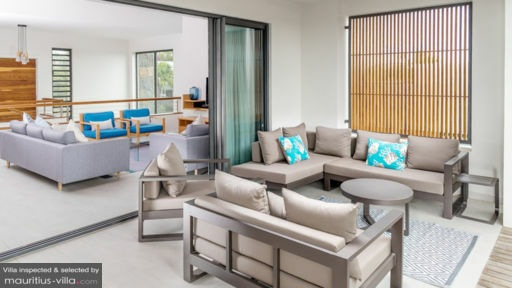 Boasting a contemporary and highly luxurious interior, Carlos Bay Penthouse places you in the sun-kissed village of Tamarin, on the west coast of Mauritius. 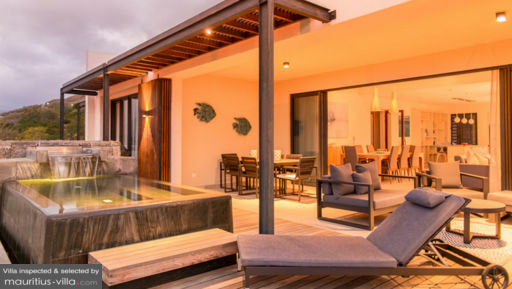 With panoramic views of the famous ‘Trois Mamelles’ mountain range, villa is perfectly suited to larger families and groups looking for accommodation in Mauritius. Featuring warm and beautifully-appointed living spaces, the villa also offers three bedrooms and plenty of space for you to relax in. Additionally, this villa is found in a highly secured complex that features various amenities including a pool and a gym. Carlos Bay Penthouse offers four bedrooms with balconies that offer spectacular views of the ocean or mountain ranges. All bedrooms are fully air conditioned and feature a King-sized bed each. In the master bedroom, you’ll also find a safe where you can keep your valuables during your holiday. Each room also includes its own en-suite bathroom with shower and tub. Carlos Bay Penthouse offers a sheltered terrace with a plunge pool where you can relax in after a tiring day of adventures under the sun. There’s also a large shared pool in the complex’s common area. From your terrace, you can revel in panoramic views of the mountain ranges. 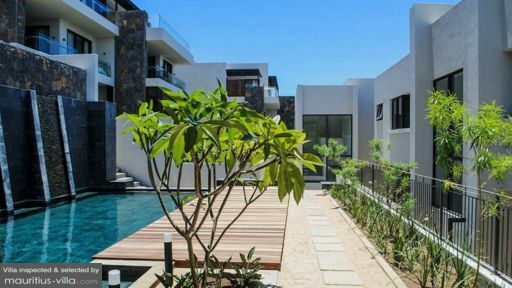 Consequently, it offers the ideal setting where you can bask in the sun and work on your tan as you enjoy a gloriously relaxing time in Mauritius. There’s also a gas weber on the furnished terrace. The warmly appointed living areas of Carlos Bay Penthouse are designed in such a way so as to feel just like home. There’s an LCD television with satellite channels and a Bluetooth sound bar to spice up those house parties. You’ll be able to enjoy free WiFi all throughout the villa and there’s also a ceiling fan in the living room to provide some much-needed respite from the tropical heat. Additionally, a dining room table has been set up to accommodate up to eight guests. Because the villa is entirely self-catering, you will be able to make full use of the open-plan kitchen which is equipped with plenty of accessories and amenities such as a freezer, kettle, oven, dishwasher, toaster, Nespresso machine, cooler box as well as full crockery and cutlery sets. As a guest of Carlos Bay Penthouse, you can be sure to enjoy an entirely relaxing vacation without having to worry about tedious tasks thanks to the attentive staff at your disposal. Indeed, a housekeeper will show up, free of charge, Monday to Saturday to tidy up and ensure that you won’t need to worry about housekeeping chores. Additional services can be provided upon request and for an extra fee. A short drive away from the village of Tamarin takes you to the world-famous Casela Nature Park. Ideal for kids and adults alike, this park offers thrilling experiences such as roller-coasters, suspended bridges and even a zip line. This park is also known for its unique lion interactions such as walking with the lions or safaris through the enclosures. Unlike traditional zoos, this park aims to promote animal conservation and wellness. Carlos Bay Penthouse also offers proximity to the public beach of Tamarin, where you can snorkel in the cool, translucent waters or enjoy a glass-bottom boat trip in the lagoon.